Marijuana proved to be about as popular as Donald Trump in red states that voted on cannabis ballot initiatives in November, highlighting the potential for a political backlash if the incoming president looks to crack down on the MJ industry. Five states that leaned toward Trump in the 2016 elections – Arizona, Arkansas, Florida, Montana and North Dakota – had marijuana-related measures on the ballot. In each case, with the exception of Arkansas, the cannabis initiatives received almost as many or more votes than Trump garnered. Even in Arizona, the only one of the five states where marijuana failed at the ballot box, the number of votes in support of recreational cannabis legalization was within 2% of the number of votes for Donald Trump. In Florida, perhaps the most important state to go for Trump in the election, marijuana legalization passed with a whopping 71% of the vote. Trump, by comparison, received 49% of the vote. In Montana, approximately 4% more votes were cast in support of marijuana legalization than for Trump, while the count was essentially even in North Dakota. 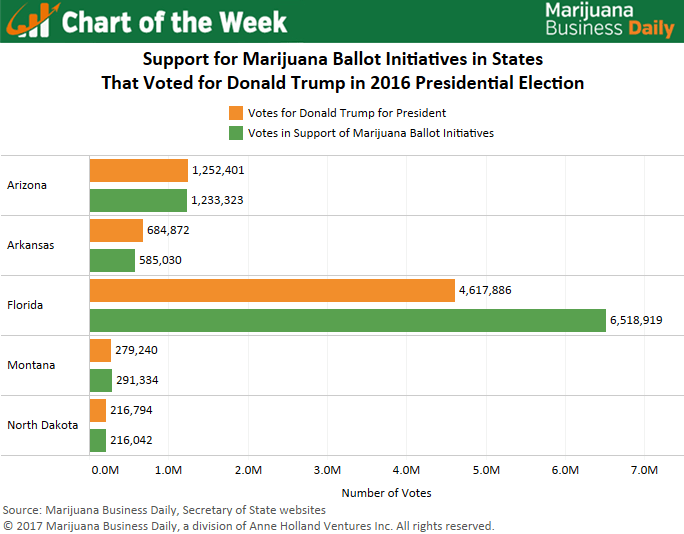 Arkansas had the largest disparity between votes for Trump and votes for legalization, but only because of the overwhelming amount of support for Trump in the state. Legalization passed with 53% of the vote. Trump’s position toward the industry remains somewhat unclear, as he has made comments both in support of medical cannabis and critical of recreational marijuana. That’s created a lot of uncertainty in the cannabis industry. A December poll conducted by Marijuana Business Daily showed that over half of executives in the cannabis industry are somewhat or very concerned about their business prospects under a Trump administration. Much of this concern stems from Trump’s selection of Alabama Sen. Jeff Sessions as U.S. attorney general. Sessions’ hostility toward marijuana use is well-documented. He did little to assuage the fears of industry executives during his confirmation hearing last week, though the bright spot is that he didn’t come out aggressively against cannabis. No matter how the new administration handles marijuana, the consequences fall squarely on President-elect Trump – and this election cycle has clearly shown that a federal crackdown would come at a political cost. For those who didn’t understand Senator Jeff Sessions response regarding Federal Marijuana enforcement. He basically said he would never commit to not enforcing federal law. If Congress should feel the law needs to be changed, then they need to change it, it’s not up to the Attorney General to change it. The Attorney General doesn’t have the luxury of picking and choosing what laws it wants to enforce, however the allocation of resources are a factor, and needs to be taken into consideration. Sessions also acknowledged the founding father’s intent to avoid Federalism and respect State’s rights. In my opinion, as a person who actively supports federal legalization, Senator Sessions gave generally a positive answer. Of course he wouldn’t commit to not enforcing federal law in any context, doing so would place him in a political quagmire on other issues where federal and state’s rights intersect. Trump has consistently stated his support of state’s rights in this arena. The cannabis industry would do better without all the fear mongering perpetuated by the media. The words out of Jeff Sessions’s own mouth, less than 1 year ago in another congressional public forum, gave the cannabis industry solid reasons to “fear” his nomination for U.S. Attorney General. “Good people don’t smoke marijuana,” Sessions said, in lambasting the administration of President Barack Obama for not being “grown ups” and more aggressively enforcing federal law. Combine those public statements with the Drug Enforcement Administration’s preposterous ruling last August to reaffirm the Schedule I “marihuana” fraud, and it could spell doom for the progress made nationwide over the last 20 years. This is not media “fear mongering,” it’s reality. No one knows exactly what will happen after this Friday, Eric, since Donald Trump himself is extremely unpredictable and the Republican-dominated United States Congress shows very little willingness to protect or expand the $6+ billion legal cannabis industry. Eric those are my sentiments exactly and they are factual. Besides, there are too many people in Trump’s inner circle who are favorable to cannabis whether rec or medical. The state’s rights issue is the best thing we have going. Sessions has bigger fish to fry than the cannabis industry. I am a firm believer that facts tell but stories sell. DJT has said that he will help vets. Vets need to be able to obtain cannabis without worrying about losing their benefits. Moreover, their stories about how cannabis has help their conditions, including suicide, is worth more than any lobbying effort. The same is true of children getting off of Ritalin and elderly folks sharing stories of relief from arthritis, glaucoma, insomnia, and, athletes giving up opiates for cannabis. Trump is a pragmatist and a realist. Keep in mind, he has questions about vaccinations. Great article, we are all waiting to see where Trump stands on cannabis but we know for certain that the backlash will be huge if he goes against it. Trump was elected to get the economy growing not to waste time going after pot -he’s cool with medical -he’s a pragmatist not an ideologue which is cool. Congress has defunded federal interference in states with pot laws and the 9th circuit has upheld it so no US attorney is going to file a case that will be lost. I really like Obama but he lacked the business sophistication we needed for economic growth. Since Mr. Trump is so avidly interested in bringing and keeping the US jobs in the US, then I would imagine if the cannabis industry could show him how many homegrown jobs the industry has and will creat in the past and the coming years, then he will be inclined to let the state regulated/tax paying cannabis businesses operate with no interference by his AG. There are a lot of rational reasons why Trump could or should support the current state of marijuana laws, but its also quite possible that he does not. There is a real valid risk that Trump decides to dial back all the progress that has been made at the state level and it would not be hard for him to do so. This is a president that has violated every instance of what he “should do” and still won the presidency. I doubt very much he is going to worry about the backlash if he decides to neuter this emerging industry. Personally, I’m waiting to see what Trump’s official policy is before I risk capital in this industry, or at the very least a tweet saying he is not going to interfere.